Where do we start in our discussion of the Washington Nationals? At what point do we stop saying this is just Spring Training and the results do not matter? It is really picking and choosing like an a la carte menu. Some results based on a players’ 2018 season should give some signs that we need to be concerned. There are a few struggling players who have been inconsistent this spring like Patrick Corbin and Trevor Rosenthal who you keep an eye on their mechanics, but there are others who we should talk about their spring in detail mostly because they finished up 2018 with question marks. The sample sizes are small and in some cases very small so we can dispense of all of the “small sample sizes don’t count”. Hopefully this is all an over-reaction. Here are three players to discuss in detail: Brian Dozier, Kyle Barraclough and Ryan Zimmerman. Brian Dozier is 4-29 against right-handers batting .138 this spring and .179 overall. Neither are good, and maybe he just needs more at-bats to get his timing right because his K rate is 30.8% for a player who was at 23.3% last year. What is troubling is how Dozier finished his 2018 season with the Dodgers batting .182. His spring training numbers are essentially how he finished 2018, and he blamed his results on a knee bone bruise. Dozier turns 32-years-old in May and is on a one-year deal with the Nationals. The good news is Ryan Zimmerman is once again bashing left-handed pitching at a .308 clip, but Zim is 1-14 batting .071 against right-handers this spring which is not a sample size to really feel that it is indicative of much as Zim will hit righties better with more at-bats, but will his righty/righty splits hover near Mendoza again? Overall he has had 27 at-bats because of the time he missed, and he says he needs 50 at-bats to be ready. The issue is Zim for several years has had extreme splits, and last year hit righties at .228 and lefties at .377. The good news is the Nationals have Matt Adams who can hit against right-handed pitchers in what should not be a straight platoon but rather manager Dave Martinez needs to play match-up baseball in his line-up construction. Kyle Barraclough blew the save last night and has now given up 3 home runs with a 5.19 ERA and a 1.50 WHIP and by coming in late in games he is not exactly facing MLB starters or even bench players who exit these spring training games earlier. The sample size is 8 2/3 innings, but the issue is we are seeing a Barraclough six months removed from an awful finish to his 2018 season. If there is any good news, Bear Claw is much better than his second half stats last year but nowhere close to his fantastic first half of 2018 when he posted up a 1.28 ERA and a .969 WHIP. Barraclough’s velo has been hovering around 92 mph, and that is about 2 mph below where he was in 2018. While some of what you just read is sobering, you have to believe general manager Mike Rizzo is two steps ahead on this and is not overly concerned. The Nationals on the other end of the spectrum is all the good news. The catching tandem of Yan Gomes and Kurt Suzuki are crushing the baseball. Gomes is batting .400 and Suzuki is at .333. Adam Eaton is running well and he leads the starters with a 1.232 OPS. The youngsters have looked great. Juan Soto is doing what he did last year, and Victor Robles, Carter Kieboom and Luis Garcia are all batting over .300. While Kieboom and Garcia will start their seasons in the Minor Leagues, they are the depth and the future of the Nationals. All teams are experiencing lows and highs this spring. Some of the lows of spring will be the highs of the summer, and we will see if Dozier is the Dozier of 2016 and Zimmerman is the Zim of 2017 and Barraclough is the Bear Claw of the 1st half of 2018. It could all turn around for these players who have long track records, but we are at the point where we can discuss some observations and hope for the best. 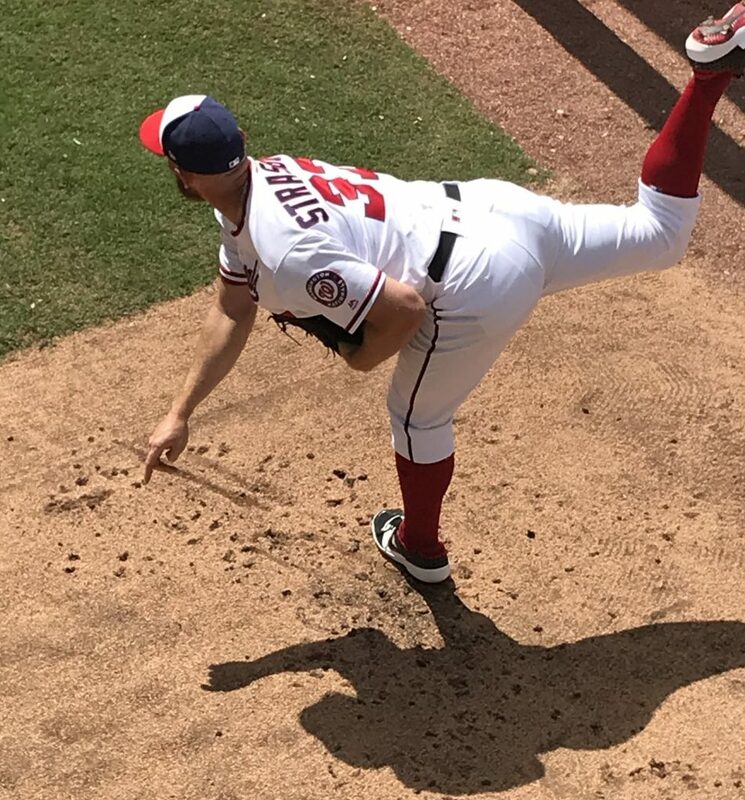 For this afternoon’s game, the Nationals have Stephen Strasburg on the mound, and the Nats will face righty Miles Mikolas in the final Saturday of Spring Training. This entry was posted in Analysis, InGame, SpringTraining. Bookmark the permalink.